What Is UGC NET And How To Crack It? Every little girl has at some point, has played teacher-teacher and harboured the ambition to be a teacher. Clichéd as it may sound, it has been an integral part of most of our childhoods. For those of us who followed through with it even as adults, you should know about the UGC NET exam. The National Eligibility Test (NET) is conducted by the University Grants Commission (UGC) and the National Testing Agency (NTA). It is a test for measuring eligibility of Indian candidates who want to be lecturers in colleges and at the university level as well as for the award of Junior Research Fellowship. Because of the conducting bodies, it is also called the UGC NET or NTA-UGC-NET. It standardizes the minimum requirements for entrants in professions of teaching and research in Indian universities. It is a very useful method employed by the UGC to select the correct candidates from among the pool of applicants. Until very recently, the NET exam was conducted by the Central Board of Secondary Education (CBSE). However, this year onwards, it will be conducted by the NTA. In a press release, the Indian Government stated that the exam will be conducted twice a year. Besides the erstwhile offline exam will not be conducted online. What job can I get after qualifying in the NET? The obvious answer to this is that you can become a lecturer or research fellow in Indian colleges and universities, of course. But it does not end there. In 2013, the University Grants Commission (UGC) announced that upon successfully clearing the UGC NET exam, candidates also become eligible for lucrative jobs in public sector undertakings (PSUs). Their UGC-NET scores can be used by PSUs for their recruitment process. The candidates become eligible for the post of executives in several public sector organizations in various disciplines such as research and development in science, management, corporate communications, human resources, and finance. This step taken by the UGC goes a long way in enticing more students to take the exam as the number of students appearing has witnessed a decline over the last few years. How can I qualify for the UGC NET? Qualifying for the UGC NET exam requires multiple steps. Firstly the candidates must obtain minimum qualifying marks with aggregate 55% marks to General and 50% to others in the master's degree. The paper consists of two parts knows as Paper 1 & Paper 2. The candidates have to answer a total of 150 questions in both the papers combined in 3 hours. The candidates scoring higher than the cut-off percentage qualify for Junior Research Fellowship positions. Besides, the top 6% of candidates in each subject and category become eligible for JRF only if they haven't applied for Assistant Lecturer. A merit list is then prepared from all the qualified students which states which candidates will be offered research positions. Are there any reservations in Junior Research Fellowships? In accordance with the Government of India's reservation policy, UGC provides reservation quotas to students clearing the NET while awarding the Junior Research Fellowship positions. As per the policy, a minimum of 27% fellowships are for candidates from OBC, 15% for SC, 7.5% for ST and 5% of fellowships are reserved for people with disabilities (PWD). How do I prepare for NET? Coming to the most important question - how to prepare for the exam? We will be looking at some tips which will help you crack the UGC NET. The exam seems like a hard one to ace and candidates often say that the papers are tough. However, if you believe teaching is your calling, with some simple preparation methods you will definitely be able to clear the exam with flying colours. The exam is divided into two papers namely Paper 1 and Paper 2. Paper 1 is about general aptitude questions whereas Paper 2 is about your selected subject. Pick up good books recommended by the UGC to understand the syllabus and prepare well. If you’re thoroughly familiar with the syllabus, you will be able to plan your time better. That way, there will be no need to skip a topic too close to the exam. As they say, Rome was not built in a day. The NET can’t be cracked either. Experts recommend three to six months for preparing for the test. So if you are planning to appear for the UGC NET examination, the idea is to start early and spend as much time as possible on your preparation. Set aside a few hours every day to prepare for the exam. Make a time table if needed. 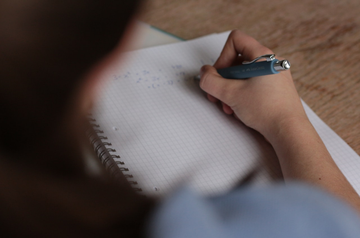 The human brain remembers things much more accurately after writing it. As a result, taking and making your own notes will go a long way in helping you prepare. Besides, your own notes are much easier to skim through and will help you a lot when you are revising your syllabus just before the exam. Try and collect as many question papers from previous years of the exam as you possibly can. Past question papers are an extremely accurate insight into your own. They will tell you what to expect and help you prepare for it accordingly. Once you are done prepping, you can use them as mock tests. They help set a bar for you to understand your performance and where you need to improve. If you cannot solve them by yourself, don’t hesitate to take the help of a mentor, senior or teacher to improve. Out of the two sections in the paper, one will be on the subject of your choice while the other is a common paper for all which tests your aptitude for teaching and general awareness. While it is crucial for you to have a good score in the paper of your subject, you cannot clear the exam without clearing both papers. So don’t focus on one at the expense of the other. Prioritize both and given equal prep time to each one so you can get a good overall score. The UGC NET is as much about speed as it is about accuracy. You need to get a lot of answers right fast. The only way to become efficient is to practice a lot. Constant practice will help you know which question is to be solved now and it will become more mechanical during the exam. It is a good idea to time yourself while taking mock tests so you know where you need to hurry up. There is no point in being quick if you can’t get it right. The purpose behind being quick is that you do not miss out on anything you know while spending a lot of time behind something you don't. But covering a lot of the paper and getting too little correct is a bad idea too. There has to be a balance between speed and accuracy. When you are timing your mock tests, also correct them and see what you’re good at. Also, analyze what you’re getting wrong and can improve. When preparing for tough exams, it is human nature that our whole world is about just that. But as the old saying goes, all work and no play makes Jack a dull boy. Don’t isolate yourself from your friends and family or give up on all your hobbies in a mindless quest to prepare for the exam. Take breaks. Listen to music. Watch one episode of your favorite sitcom or call a friend. Do whatever makes you happy. The break will help you rejuvenate and prepare better. Remember your answers will be as confident as you are. It’s very natural to feel butterflies in your tummy before exams but don’t let it get the better of you. Being too anxious will only lead to you making mistakes you otherwise wouldn’t. Keep calm and keep the faith. You have prepared well and done everything you can. Tell yourself you’ll do well. It’ll do miracles in terms of boosting your confidence. These tips and tricks will help you prepare better for the UGC NET exams. Have you given the exam already? Or are you planning to? What has your experience been like? Tell us in the comments. Thank you I m want to clear this xm but I don't get ri8 book for commerce subject..
@kavita anyone can give net exam. Percentage in your MA doesn't matter. Thank You so much for sharing this. . Seriously, me yahi search krre thi aaj Google pe . . Thanks alot .... Kindly please share more career options after mcom. . And yaa mne 2 bar NET ka exam diya hai . . And ab dubara Dena hai . .